Upgrades the spaceship design and space combat systems! Ensures that recent, popular science-fiction cinema and television settings will be easily simulated! Updates the rules to conform with changes since the last edition brought about by GURPS Compendium I, Traveller, Ultra-Tech 2, and Vehicles. 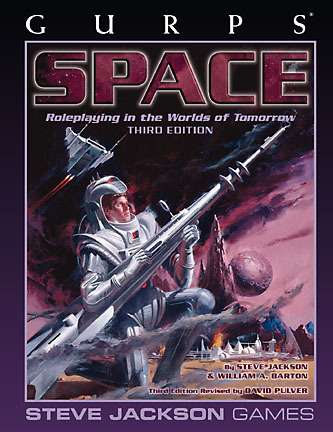 In addition to the above topics, GURPS Space offers an inventory of science-fiction equipment from lasers to force swords, treatment of classic science-fiction character types, advice on creating planets and the cultures that inhabit them, and much more! If you're looking for Fourth Edition material, the newest edition of GURPS Space replaces and expands on all of the information from this book. GURPS Space: Unnight – Discover the lost colony orbiting Stuzak! GURPS Space Adventures – Three new adventures to let your science fiction campaign soar! GURPS Space Bestiary – In the outer reaches of the galaxy, life can take weird forms indeed. This book presents over 300 extraterrestrial creatures for the science fiction roleplaying campaign. StarGen for PC and StarGen for Mac – A really great program for creating whole star sectors and zooming in to generate individual stellar systems.